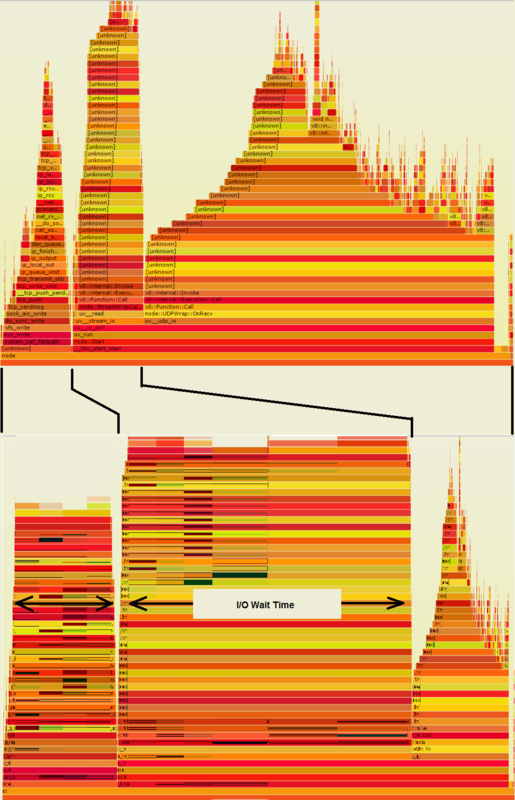 I try to do some nodejs profiling using Linux perf_events as described by Brendan Gregg here. Problem is that there are a lot of [unknown] elements, which I suppose should be my nodejs function calls. I assume that whole process fails somwhere at point 3, where perf data should be folded using mappings generated by node/v8 executed with --perf-basic-prof. /tmp/perf-PID.map file is created and some mapping are written to it during node execution. I am using CentOS 6.5 x64, and already tried this with node 0.11.13, 0.11.14 (both prebuild, and compiled as well) with no success. FIrst of all, what "[unknown]" means is the sampler couldn't figure out the name of the function, because it's a system or library function. If so, that's OK - you don't care, because you're looking for things responsible for time in your code, not system code. What was a big juicy-looking pile on the right has shrunk, so it is nowhere near as significant. On the other hand, the I/O towers are very wide. Any one of those wide orange stripes, if it's in your code, represents a chance to save a lot of time, if some of the I/O could be avoided. Notice, if all those rectangles were collected, you could see that it accounts for 11% of time, meaning it is worth looking at. If you could cut its time in half, you could save 5.5% overall. If what it's doing could actually be avoided entirely, you could save 11% overall. 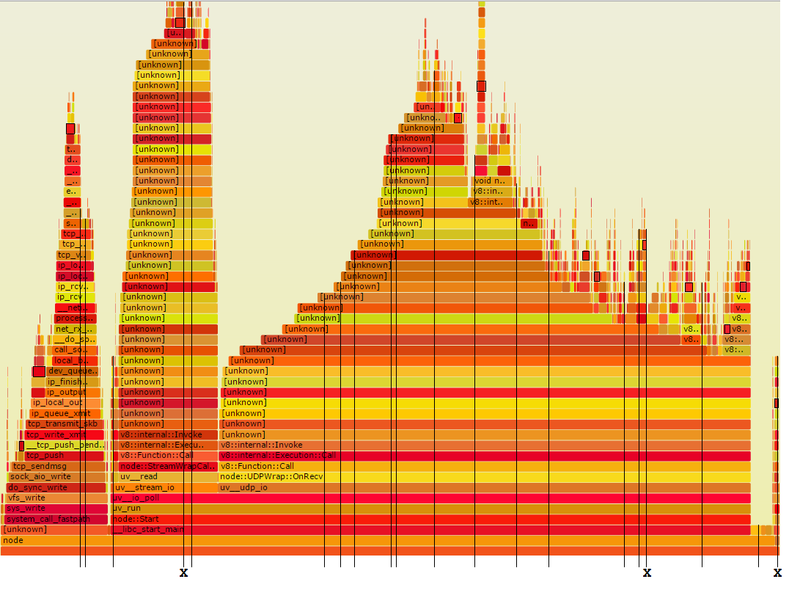 Each of those little rectangles would shrink down to nothing, and pull the rest of the graph, to its right, with it. The slender vertical lines represent twenty random-time stack samples. As you can see, three of them are marked with an X. Those are the ones that go through Foo. That's about the right number, because 11% times 20 is 2.2. Looking at those 20 samples might seem a bit daunting, because they run between 20 and 50 levels deep. However, you can basically ignore all the code that isn't yours. Just examine them for your code. You'll see precisely how you are spending time, and you'll have a very rough measurement of how much. Deep stacks are both bad news and good news - they mean the code may well have lots of room for speedups, and they show you what those are. Anything you see that you could speed up, if you see it on more than one sample, will give you a healthy speedup, guaranteed. The reason you need to see it on more than one sample is, if you only see it on one sample, you only know its time isn't zero. If you see it on more than one sample, you still don't know how much time it takes, but you do know it's not small. Here are the statistics. Generally speaking it is a bad idea to disagree with a subject matter expert but (with the greatest respect) here we go! "Please be sure to answer the question. Provide details and share your research!" So the question was, at least my interpretation of it is, why are there [unknown] frames in the perf script output (and how do I turn these [unknown] frames in to meaningful names)? This question could be about "how to improve the performance of my system?" but I don't see it that way in this particular case. There is a genuine problem here about how the perf record data has been post processed. The answer to the question is that although the prerequisite set up is correct: the correct node version, the correct argument was present to generate the function names (--perf-basic-prof), the generated perf map file must be owned by root for perf script to produce the expected output. Writing some new scripts today I hit apon this directing me to this SO question. Not the answer you're looking for? 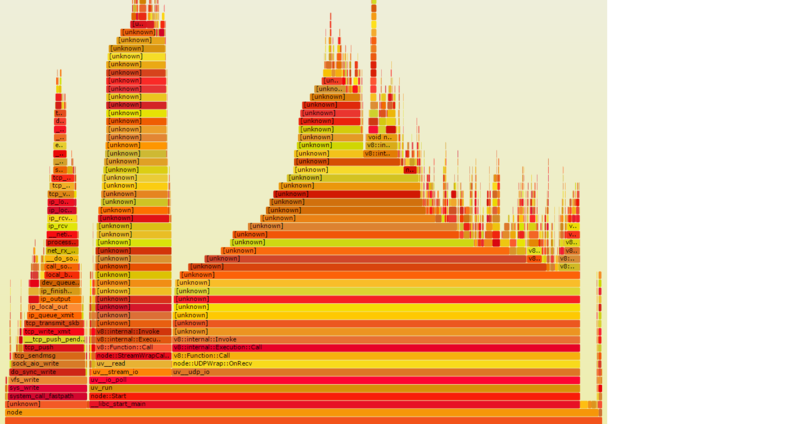 Browse other questions tagged node.js performance profiling v8 perf or ask your own question. 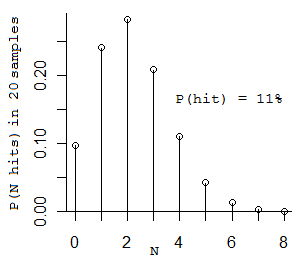 Profiling number crunching code: 28% of time in fegetexcept() & optimal compiler flags? How to check which version of v8 is installed with my NodeJS? How to fix Error: listen EADDRINUSE while using nodejs? 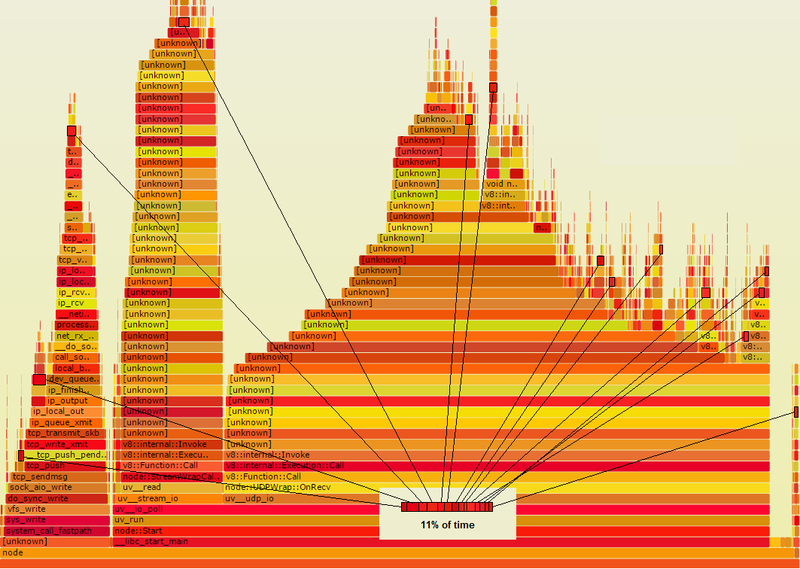 How does linux's perf utility understand stack traces?